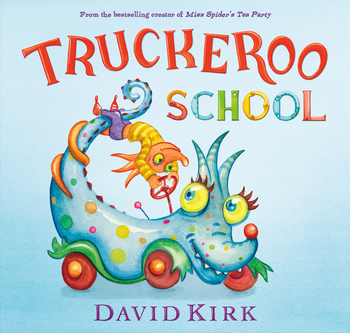 This joyful story and picture book about creativity and acceptance will touch little monsters and their families, especially those who love TRUCKS! Must drive a truck—the children too. Meet the little monsters of Truckeroo! The kids all have trucks that suit their personalities—big trucks, small trucks, loud trucks, quiet trucks. Families help them build and care for their trucks. And they get to bring them to school! David Kirk is the author of Oh So Tiny Bunny and Oh So Brave Dragon and the creator of Miss Spider, who appears in many well-loved children's books, in her own television series, and in a number of popular apps. An inventor as well as an author, he lives in King Ferry, New York, with his wife, Kathy, and their daughters, Primrose and Wisteria.